Flint, Mich. – The Flint Firebirds have acquired Matthew Menna from the Sudbury Wolves and Keenan Reynolds from the Owen Sound Attack. 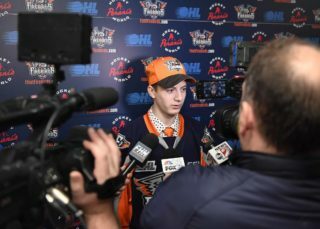 Menna, a native of Aurora, Ont., was drafted in the seventh round of the 2014 OHL Priority Selection by Sudbury. In 10 games with the Wolves this season, he recorded a 4.77 GAA and a .860 SV%. 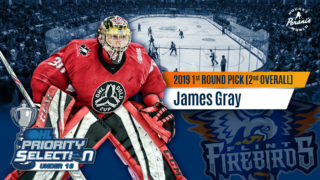 The Firebirds traded a seventh round pick in 2017 to Sudbury in return. 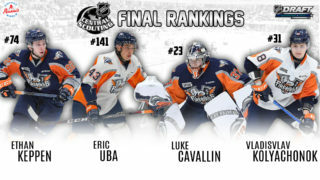 Reynolds was chosen in the fourth round of the OHL Priority Selection in 2014. The Ottawa, Ont. native tallied one goal and added three assists for a total of four points in 42 games played with the Owen Sound Attack last season. In return, the Firebirds traded a fifth round pick in the 2017 OHL Priority Selection to Owen Sound. The Firebirds will return home to the Dort Federal Event Center Saturday, Jan. 23 against the Windsor Spitfires. Puck drop is set for 7:30 p.m. (EST). All Flint Firebirds home games in the month of January are “Food Drive” games where fans can bring in five canned or boxed food items and receive $5 off a silver ticket. Tickets are $12/Bronze, $15/Silver, $19/Gold and $25/VIP and can be purchased online at ticketmaster.com or by visiting or calling the Dort Federal Event Center Box Office Monday thru Friday, 9 a.m. – 5 p.m. at (810) 744-0580. Saturday and Sunday game day box office hours begin at 10 a.m.